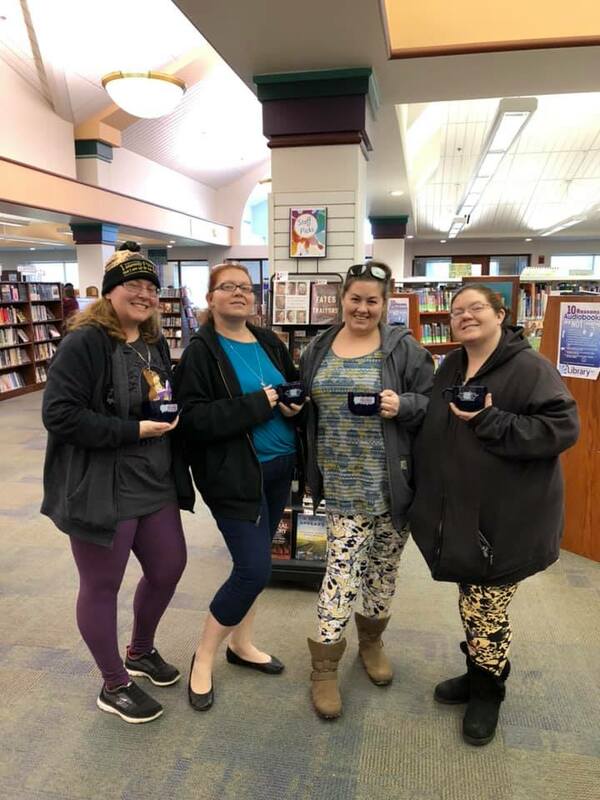 Winter Reading Challenge participants take their "mug shot"
And, don't forget the awesome mug shots! Of those nearly 5,000 books logged, which titles were the most popular? Check out the Top 10! This much-anticipated autobiography was the number one book logged for the 2019 Winter Reading Challenge. With honestly, and lively wit, former First Lady Michelle Obama describes her triumphs and disappointments, both public and private. One of the most popular book titles in the catalog (as of April 2019: 181 holds!) "Where the Crawdads Sing" was chosen often by WRC readers. This stunning debut novel from bestselling nature writer Delia Owens is about an unforgettable young woman determined to make her life in the wilds of North Carolina and her complicated relationships with the two men who break her isolation. Participants really enjoyed this self-help book by Rachel Hollis, lifestyle guru and author who presents a guide to becoming a joyful, confident woman by breaking the cycle of negativity. Tara Westover's transformative memoir of her journey toward achieving a proper education for herself and others continued to be a favorite in the 2019 Winter Reading Challenge. This mysterious and unforgettable legal thriller about Pete Banning and the murder of Reverend Dexter Bell on a cool October morning in 1946 was a popular choice on participants' reading logs. The Allbright family's epic journey was another popular choice. Being left a homestead by a buddy who died in the Vietnam War, Ernt Allbright moves his family to the vast wilderness of Alaska completely unprepared for the cold winters and isolation. After the winter release of the Netflix movie adaptation of Bird Box, Josh Malerman's suspenseful horror story about a deadly and invisible force ravishing a near-future world became a favorite of WRC readers. In this hilarious and popular novel logged multiple times by WRC readers, Chinese-American Rachel Chu is unexpectedly introduced to a rich and handsome man from Singapore whose family opposes the relationship. This North Carolina romance about two strangers, their unfathomable connection, and a letter, was a popular WRC choice. This young adult novel, "The Hate U Give" received plenty of reads during the WRC. After witnessing her friend's death at the hands of a police officer, Starr Carter's life is complicated by encounters with the police and and a local drug lord.